You can be up and grilling in no time with the speedy 10 second set up and foldaway system. 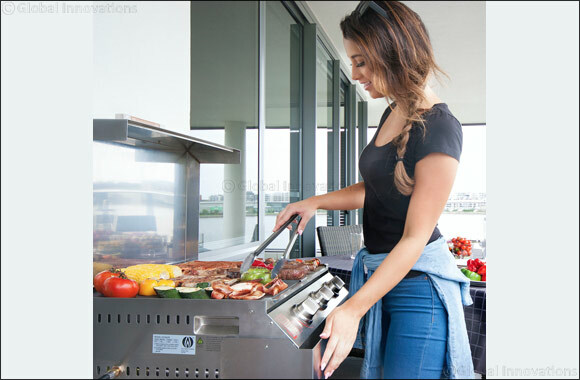 BBQ weather woes are a thing of the past as the Space Grill is the only BBQ approved for indoor as well as outdoor use, so al fresco dining or cozy dinners – the choice is yours! When was the last time you enjoyed brunch fresh off the barbie? The Space Grill’s ceramic-coated reversible hotplate offers a versatile cooking surface for everything from burgers and buns to eggs and bacon as well as being perfect for searing and sautéing veggies too. The Space Grill has a patented auto fold-down large drip tray which captures all run off grease in an easy to clean, easy access, detachable tray. With its revolutionary foldaway design, the Space Grill is compact and travel friendly so you can pop it in your car and take it wherever the occasion takes you. With measuring only about 24 inches high, 26 inches wide and only sticking out about 8 inches from the wall when folded away, the Space Grill can be installed in areas that most other grills cannot usually go. Handrails, stands, walls or other free standing, sturdy structures can be home to the patented mount and hinging system so balcony BBQ’s are in business! With a spacious 475 sq. inches of grilling room, the Space Grill can cook up enough food to serve 10 people in one go. The Space Grill has been the winner of multiple awards including the 2018 Vesta Award for Best Outdoor Gas Grill and Best in Category at the Good Design Awards. The Space Grill has undergone extensive testing and is certified for USA, Canada, UK, EU and Australian markets. The double skinned sides reduce heat transfer and the lid doubles as a nifty backsplash to deflect heat and avoid heat damage. Every Space Grill comes with a standard 5-year warranty so you can grill with peace of mind. As if you needed any more reasons why Space Grill is already the choice grill of so many, you too can spend less timing looking and more time cooking with the addition of your very own Space Grill. The Space Grill is available for AED 4999 including VAT. Get your hands on the BBQ of the future and start enjoying your Space Grill today!